This training is intended to support participants in having a deeper integration of empathy. In a supportive, community environment, participants experience challenge, guidance and support in the practice of empathy and seeing our world empathically. Throughout our time together we will learn to increase our capacity for being present, learn to focus our awareness, and develop the ability to work with our own capabilities and humanity, in real-time situations. Feelings and needs are the focus of empathy, so our relationship to them directly influences the quality and depth of our empathy. At this intensive, through practice and exercise, we will broaden and enrich our understanding and experience of these “life energies” thereby deepening our practice of empathy. 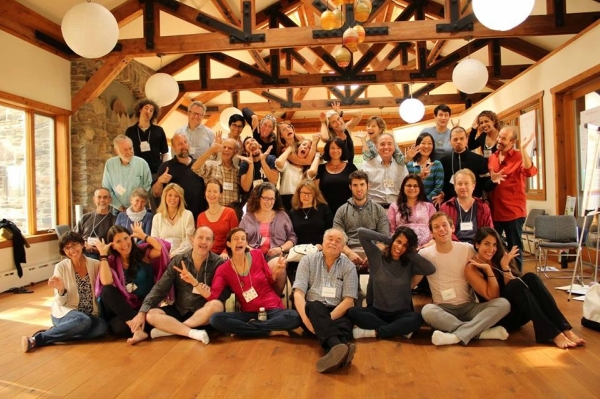 Throughout the retreat, we will build on that work with well-defined empathy processes to bring a fruitful, sustainable practice of empathy into your life. This training is designed for people with an intermediate to advanced experience level. This usually includes a minimum of 10 weeks NVC Practice Group experience, or a Discovery Weekend, or of 12 – 18 hours NVC training with a NVC Trainer. The Lifebridge Sanctuary is a 12,000 square foot hand crafted, green facility on 95 acres of forest and spectacular open space on the Northern crest of the Shawangunk Ridge, close to the small township of Rosendale, eighty miles north of New York City. We are very excited and grateful to be making this our “home” again this year. All meals and snacks will be provided throughout the training and are served in our communal dining hall. All food is freshly cooked onsite and features organic or all-natural ingredients. The menu accommodates gluten-free, vegetarian, vegan and omni-eater diets. Cooking services are provided while cleanup is generally shared by all. There is a Trailways bus that goes from Port Authority in NYC to Rosendale (just 5 minutes from Life Bridge), as well as a Metronorth train arriving in Poughkeepsie where you can take a LINK shuttle to Rosendale. We will provide pick-up from there. Stewart Airport is 40 minutes away. We will also provide a shuttle from there. Registrations for first-time participants of our residential training retreats include an intake dialogue (usually 5-10 minutes) regarding your NVC experience, your physical needs and comfort, your training needs, our understanding of details (times, dates, payments and so forth), plus any preparation we imagine would add to your learning so that you have the best experience possible. Registrations are then completed by phone or over the internet (link provided by email after dialogue). To facilitate this intake dialogue, please click here to complete the Pre-Registration Form. If you have previously attended an NYCNVC Residential Intensive and you would like to register OR if you have any questions, please contact Clara at coursecoordinator@nycnvc.org or (646) 201-9226.